Spectra in which corresponding lines are observed. Iron when weakly incandescent gave but one of these lines; when strongly incandescent, however, a third was visible. Double line; several weak lines were also visible between g and A. 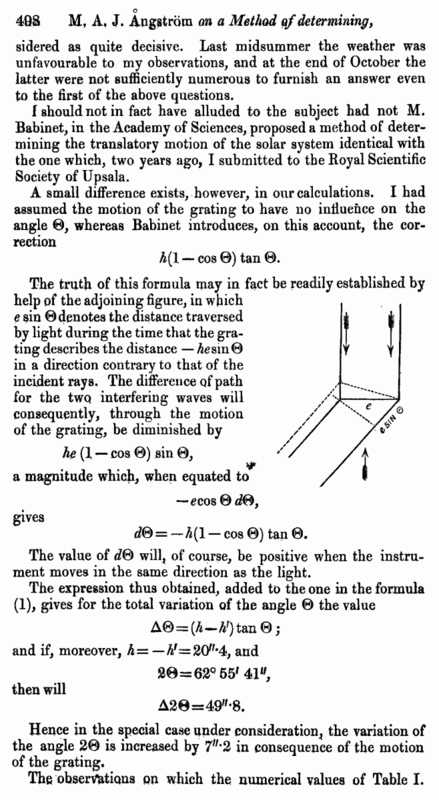 In a lecture given on October 6, 1860, to the Royal Scientific Society of Upsala, I explained a method of determining the motion of the solar system by observations on the interference-bands of a glass grating. 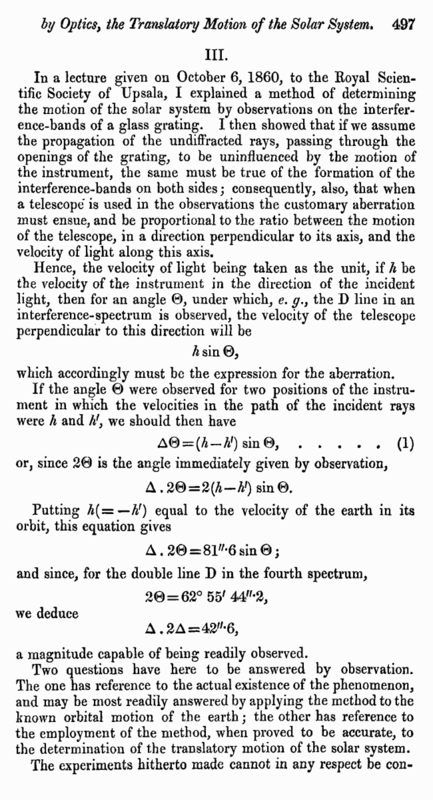 I then showed that if we assume the propagation of the undiffracted rays, passing through the openings of the grating, to be uninfluenced by the motion of the instrument, the same must be true of the formation of the interference-bands on both sides; consequently, also, that when a telescope is used in the observations the customary aberration must ensue, and be proportional to the ratio between the motion of the telescope, in a direction perpendicular to its axis, and the velocity of light along this axis. which accordingly must be the expression for the aberration. a magnitude capable of being readily observed. Two questions have here to be answered by observation. The one has reference to the actual existence of the phenomenon, and may be most readily answered by applying the method to the known orbital motion of the earth; the other has reference to the employment of the method, when proved to be accurate, to the determination of the translatory motion of the solar system.